One of our youth football insurance clients recently had an unfortunate death claim caused by exertional heat stroke. The General Liability carrier settled the case at the policy limits of $1,000,000. We wanted to share some of the lessons learned so that our insurance clients and the youth football community at large can prevent such a terrible event being repeated. The purpose of this article is not to suggest exactly which policies should be implemented in your local youth football league. Instead, it is to provide an educational awareness of some of the critical factors that have led to deaths and resulting litigation and to provide links to authority resources for more information. Primary emphasis will be on prevention and response to exertional heat stroke. Which Organization Sets the Standard of Care for Heat Illness: NFHS, NATA, KSI? Exertional heat stroke is a serious condition and one of the leading causes of death during the preseason of youth tackle football. And according to experts, it is 100% preventable when the correct guidelines are adopted and implemented. But what are the correct standards of care and what organization sets these standards? The answer to this question is complicated and very much up in the air. The correct answer is whatever a court says the standard of care is in a particular state. 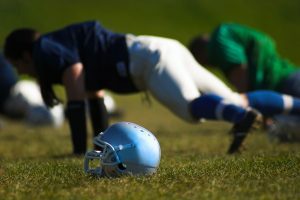 Defense attorneys will argue that absent specific legislation, youth football volunteers are held to a lower standard of care than school employees but generally should comply with their state’s version of National Federation of State High School Associations (NFHS) guidelines. However, plaintiff attorneys will argue that the standard of care is the more aggressive policies published by the National Athletic Trainers’ Association (NATA) and the Korey Stringer Institute (KSI). Quite a few state high school athletic associations have recently adopted some of the more stringent NATA and KSI position statements on heat acclimatization, including NJ, TX, CT, NC, and GA. KSI ranks the various state high school associations’ compliance with their policies. Flexibility is required when setting policies because of the varying climates in each region of the country and state, and each local organization has different resources. Regardless, youth tackle football organizations should, at a minimum, meet the policies or guidelines set by their state’s version of NFHS and strive to meet the higher policies set by NATA and KSI if at all feasible. Heat Syncope: Symptoms include fainting or feeling lightheaded due to blood pooling in the lower extremities, which reduces the heart’s ability to provide enough circulation. A lack of heat acclimatization and poor conditioning are usually the causes of heat syncope . Treatment entails moving the athlete inside or into the shade. Athlete should lie down with legs raised 12 inches. This assists with returning more blood to the heart to normalize blood pressure. Full recovery usually occurs within hours and return to activity can resume when athlete is rehydrated and feels better. Heat Cramps: Painful muscle spasms, usually involving the calves, which are primarily caused by fatigue, dehydration, and loss of electrolytes through sweating. Treatment should consist of gentle stretching, ice applied to muscle, increased water and electrolyte consumption, and rest. Heat cramps can be prevented by proper hydration prior to, during, and after practice and by heat acclimatization. Athlete can return to play once cramps resolve. Heat Exhaustion: This is as an inability to continue to exercise in the heat from either weakness or exhaustion. Signs and symptoms are fatigue, dizziness, chills and rapid pulse. Heat exhaustion is caused by excessive fluid or electrolyte loss. Treatment includes moving athlete from hot environment to an air-conditioned room or shade and having the athlete lie on the ground with legs raised 12 inches, re-hydration, and by cooling with ice towels, misting fan, or cold water immersion. Recurrences can be prevented by proper hydration prior to, during, and after practice and by heat acclimatization. The athlete should not return to activity on the same day and recovery takes 24 to 48 hours. The public has been incorrectly taught in the past by authorities that athletes stop sweating during heat stroke and the athlete exhibits hot, dry skin. However, this is not always the case and the athlete is usually sweating at the time of collapse. Don’t let this misconception prevent the diagnosis and prompt response to heat stroke. 70% of parents cannot identify the following signs and symptoms. Early Signs and Symptoms of Heat Stroke: Headaches, dizziness, and nausea/vomiting with a rectal temperature of 104°F or lower. Treatment includes immediately moving athlete from hot environment to an air-conditioned room or shade, laying the athlete on the ground and raising legs by 12 inches, re-hydration and by cooling with ice towels, misting fan, or cold water immersion. Recurrences can be prevented by proper hydration prior to, during, and after practice and by heat acclimatization. The athlete should not return to practice without a written release from a medical doctor. Serious Signs and Symptoms of Heat Stroke– Central nervous system dysfunction such as clumsiness, stumbling, collapse, loss of consciousness, confusion, mood changes, aggressiveness, disorientation, seizure, coma or a rectal temperature of greater than 104° Athletes exhibiting these signs and symptoms should be considered to be suffering from exertional heat stroke and must be treated immediately to prevent major organ damage or death. Athlete should undergo a gradual return-to-play protocol under the supervision of a doctor and not return to play without a written release signed by a medical doctor. Any predisposing factors should also be identified and remedied prior to return to play. Rapid cooling involves planning prior to the emergency so that necessary equipment and supplies are instantly available. Ice water baths are the preferred cooling technique and immersion tubs, a water source, and ice must be available with staff trained on rapid set up. It is not necessary to use an expensive tub; a Rubbermaid container of sufficient size or wading pool will work. If an ice water bath is not available, apply ice packs to neck, armpits, and groin and rotate ice water-soaked towels to all other parts of the body. In addition, a rectal thermistor (thermometer attached to a long flexible cord) is needed to properly measure rectal temperature during cold water immersion. If you don’t have a rectal thermistor, but heat stroke is suspected based on the signs and symptoms, you should never delay immediate rapid cooling. For more detailed information, see How to Respond to an Exertional Heat Stroke Emergency. Sports organizations should have a facility-specific written emergency action plan for coordination, access and evacuation by EMS, which includes a site map. According to NATA research, exertional heat stroke has a 100% survival rate when immediate cooling via cold-water immersion or whole-body dousing is started within 10 minutes of collapse. According to KSI, an athlete experiencing exertional heat stroke should be cooled to 102 within 30 minutes. Many individuals will start with temperatures of 106 to 110°F and will cool at the rate of 1 degree for every three minutes. Cooling can take up to 20 minutes. For more details on how to properly set up cooling tubs for ice-water immersion, see Ice Water Immersion Best for Treating Heat Stroke and Practical Guidelines for Implementing Cold Water Immersion for an Exertional Heat Stroke Patient. 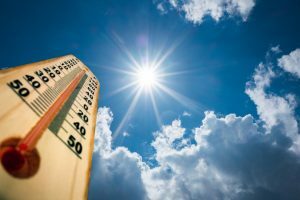 All organizations should consider mandatory training for all coaches and assistant coaches through the free online training resource offered through NFHS: A Guide to Heat Acclimatization and Heat Illness Prevention. This training introduces seven fundamentals, which, if followed, will minimize heat-related illnesses, including exertional heat stroke. All athletes participating in youth tackle football should be required to provide written evidence of either a preseason physical or medical clearance signed by a licensed health care professional releasing the athlete for play without restrictions. Medical examinations can uncover pre-existing conditions that could predispose an athlete to serious injury arising from participation. The majority of heat-related deaths occur during the first five days of practice as an athlete adjusts to being exposed to high heat levels with intense exercise while wearing heat retaining equipment. Heat acclimatization is a series of physiological adaptations that allows the body to adapt to exercise in heat and occurs over a period of 10 to 14 days. These adaptations include the ability to maintain lower body temperatures, a lower heart rate, more efficient heart function/blood distribution, faster and increased sweating, the ability for the body to store more water, and decreased salt losses in sweat and urine. Start with shorter, less intense practices with longer rest breaks between intense exercise periods. Emphasize instruction over conditioning during the first few days of preseason practice. Minimize the use of heat retaining protective gear such as helmets, shoulder pads, and pants during the first few practices. Introduce them progressively over successive days. An example would be helmets only during first two days, helmets and shoulder pads only on days 3 through 5, and full pads on day 6. Progressively introduce contact. An example would be no contact on days 1 and 2, contact with dummies and blocking sleds on days 3 through 5, full contact on day 6, and three full days of contact before first scrimmage. Hold only one practice per day in youth football. Limit practice time to two hours in youth football, which includes warm up, stretching, cool down, walk through, and conditioning. 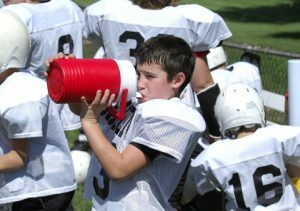 Ensure athletes begin practice fully hydrated and continue hydrating with frequent water or sports drink breaks throughout practice. Keep in mind that athletes begin the season with varying levels of fitness. Special accommodations must take into account those who are unfit, obese, suffered recent illness, have a history of heat illness and sickle cell trait. Practice must be modified for these individuals. Practice modification is required during periods of extreme environmental temperatures that increase the chances of heat illness. The modifications may include limiting total practice time, scheduling practice early or late in the day, decreased intensity, increased work-to-rest ratios, more frequent hydration and rest breaks, closer monitoring of athlete stress levels, elimination of heat-retaining equipment, unlimited access to hydration, and cancellation. WBGT is the new standard for measuring the impact of environmental temperature on athletics. WBGT is a composite temperature that takes into account air temperature, humidity, wind speed, sun angle, and cloud cover on the human body. On the other hand, the heat index merely reflects the combination of heat and humidity and “how it feels” on a person who is normally dressed and not involved in strenuous activity. The WBGT should be taken before practice and during practice at intervals if the temperature is rising. The cost of WBGT meters have been falling and currently range in price from $114 to $479 depending on the features provided. In addition, there is a smart phone app called WeatherFX available for $0.99 that provides a mathematical estimate of WBGT. However, mathematical estimates are not as accurate as an actual meter reading. If a WBGT meter is not available, the next best measure is use the heat index with a Heat Index Activity Guideline Chart. 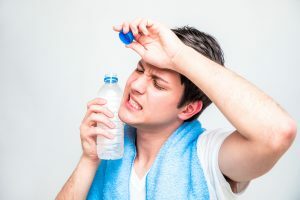 While proper hydration will not prevent heat illness, it will decrease the risk as it reduces large increases in core body temperature during intense exercise in the heat. Fluid replacement needs may vary depending on each athlete’s sweat rate. Weight loss during exercise in the heat can negatively impact heat tolerance. A loss of just 3% or more during exercise can significantly increase the risk for heat stroke. High body fat percentages, salty sweaters, and recent illnesses such as fever or gastrointestinal distress are factors that predispose athletes to a higher risk of dehydration. An athlete’s urine volume and color should be regular and light colored or nearly clear. Small amounts of dark urine indicate dehydration. See urine color chart. Before exercise: Drink 16 oz. of water or sports drink two hours before physical activity. Drink another 8 to 16 oz. 15 minutes prior to physical activity. During exercise: Drink as much as they want with unlimited supply and no restrictions. But some athletes can’t rely on thirst as an accurate gauge. As a rule of thumb, drink 4 to 8 oz. of fluid every 15 to 20 minutes (some athletes who have a greater-than-average sweat rate may need to consume more liquids). After exercise: Drink enough to replace any weight loss from exercise. As a rule of thumb, drink 16 to 20 oz. of fluid for every pound lost. What Are the Best Types of Drinks? A high sweat rate or salty sweaters. A sports drink or fruit juice with a carbohydrate formulation greater than 6% to 8% will slow stomach emptying. The appropriate sodium content in sports drinks is .4 to 1.2 grams per liter to assist with fluid retention. Avoid concentrations above this range. Energy drinks with stimulants such as caffeine and/or ephedrine. Emergency equipment and supplies such as cool immersion tub, AED, rectal thermometer, first aid kit, water source, ice, etc. David Csillan. Dangers of Heat Illness Reduced by Following Proper Guidelines; NFHS. May 15, 2017.